If you’re not a statistic? 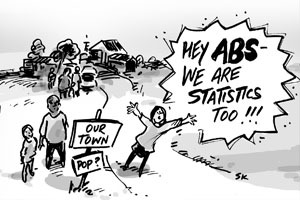 What happens if the ABS (Australian Bureau of Statistics) doesn’t have statistics for your town? Have you ceased to exist? Read the id Blog to find out the answer, and more. .id is ‘a company of population experts – demographers, spatial analysts, urban planners, forecasters, census data and IT experts who build demographic information products for Australia & New Zealand‘. From a cartoonist’s point of view, using ‘tailor made’ cartoons to highlight many of their blog posts, .id recognises the value of cartoon illustrations to catch the eye and give a fun take on quite serious information. « What does this mean?